Of all the things we pile into our days, why is it that finding time for exercise seems to be the most challenging? Want the inside scoop? 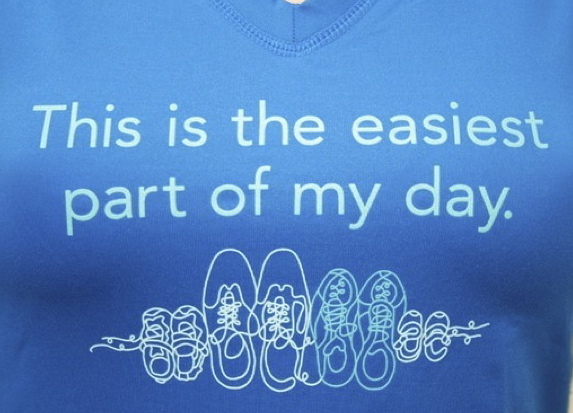 It’s really not the hardest part of your day – in fact it’s more often than not, the easiest. We just tend to make such a big deal about that one hour in the morning we take for ourselves, before the children are up, before the rest of the world wakes up and demands so much from us, and before we start demanding more of ourselves. It’s that one quiet hour on the road where you can hear your own heart beating, your shoes hit the ground, and the rhythmic pulse as your chest rises and falls with each meditative breath. There will be days when you will feel tired. You will feel worn and beat down. But even on these toughest days, this will be the easiest thing you do. This will not tell you that you can’t, that you won’t, or that you don’t deserve it. This will not challenge your patience, scream in your ears, or pull you in a hundred different directions at the same time. This will be the easiest part of your day. So get out and enjoy it, before the world wakes up, takes you on a whirlwind journey, and the sun sets.